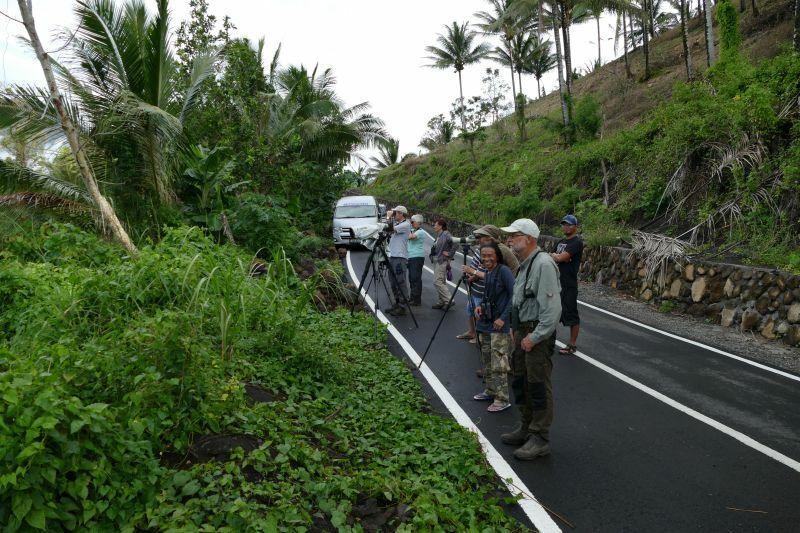 From 26 July to 16 August Nollie and I were on the Birdingbreaks.nl tour to the Indonesian islands Sulawesi (Celebes) and Halmahera. This is the transition zone between the avifaunas of southeast Asia and Australia/New Guinea. The so-called Wallace Line demarcates this transition, and was first placed (and by most still placed) between Borneo and Sulawesi, but in later life Wallace placed it between Sulawesi and Halmahera. 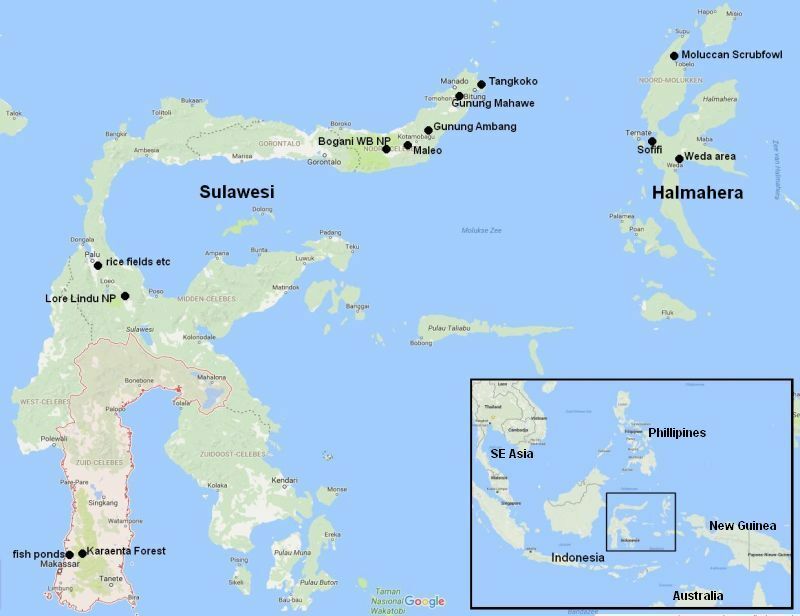 In other words, this whole zone of Sulawesi and Halmahera is a transition in steps. I found the avifaunistic difference between Sulawesi and Halmahera remarkable, so I was glad that both islands were combined in this tour. 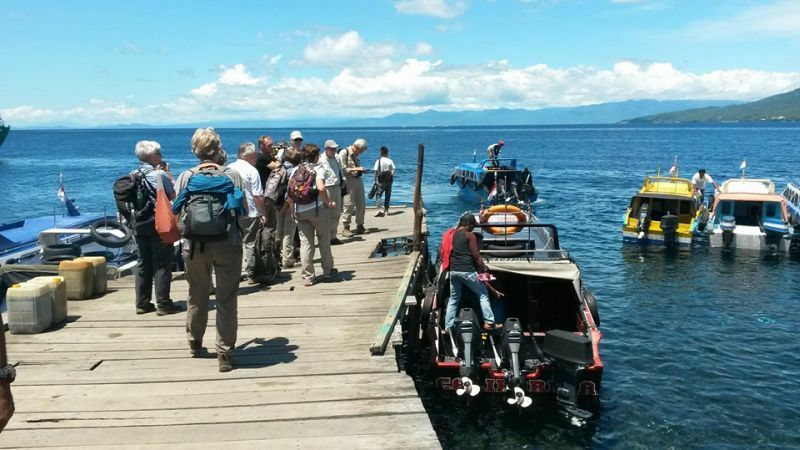 Tour leader was Laurens Steijn and local guides were Monal and Anis on Sulawesi, and on Halmahera Danny and other guides from the Weda resort. Internal flights in this trip were from Makassar to Palu, Palu (via Makassar) to Manado, Manado to Ternate (for the speedboat to Halmahera) and Tobelo to Manado. 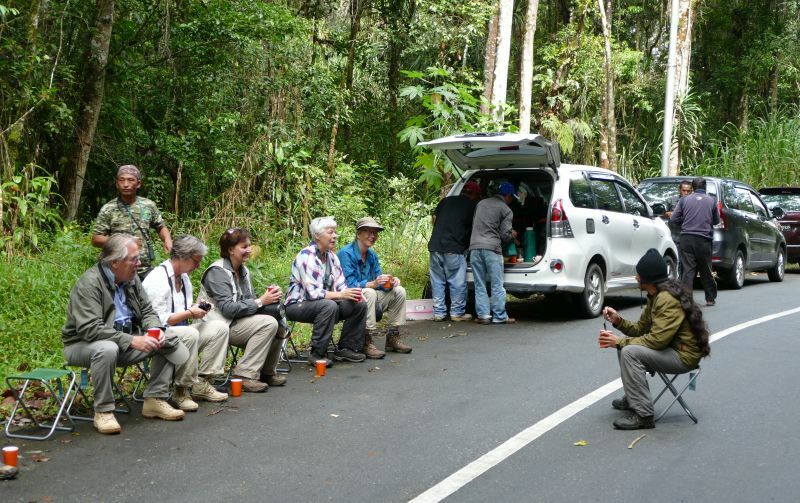 Ground transport was in bus and 4WD cars on Sulawesi, and in 4WD cars on Halmahera. 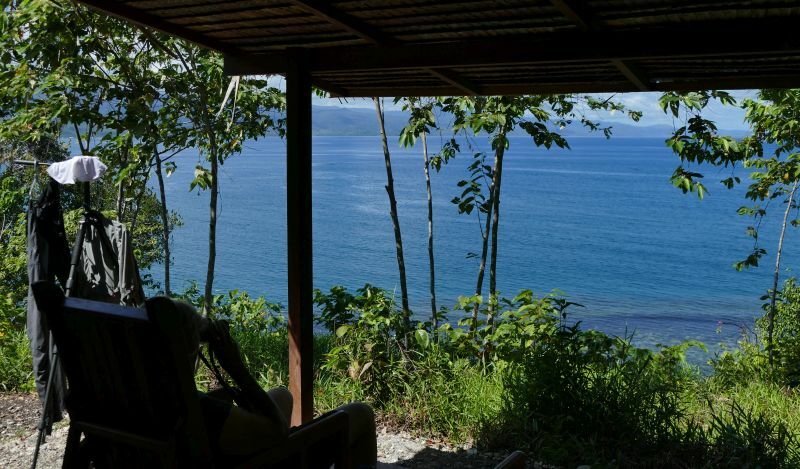 Accommodation was in hotels and pensions on Sulawesi, and in the Weda resort on Halmahera. See the map below for the birding sites we visited. These are nearly all forest sites. July/August (our summer) is normally not a period in which we would go to the tropics, but for this destination it seems the best time. We had good weather and the birds were active. 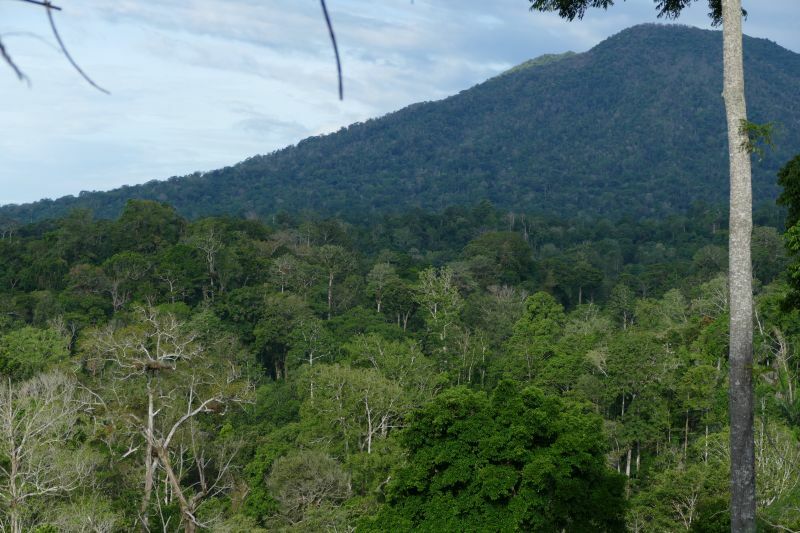 I saw 77 Sulawesi endemics (the group 5 more) and 29 Halmahera endemics (the group 3 more). Below are photos of the birding sites. A species list is at the bottom of this page. Bird photos are on a separate page. Sulawesi Serpent-Eagle, Spot-tailed Sparrowhawk, Sulawesi (Slender-billed) Cuckoo-Dove, White-faced Cuckoo-Dove (Sulawesi Black Pigeon), Grey-cheeked Green Pigeon, Western Superb Fruit-Dove, White-bellied Imperial Pigeon, Silver-tipped Imperial Pigeon, Bay Coucal, Sulawesi (Yellow-billed) Malkoha, Sulawesi Brush Cuckoo, Black-billed Koel, Sulawesi Scops Owl, Sulawesi (Purple-winged) Roller, Green-backed Kingfisher, Knobbed Hornbill, Sulawesi (Dwarf) Hornbill, Sulawesi Pygmy Woodpecker, Ashy Woodpecker, Sulawesi (Great) Hanging Parrot, Minahasa (Yellow-breasted) Racket-tail, Sulawesi Sahul Pitta, White-rumped Cuckooshrike, Sulawesi (White-rumped) Triller, Sulphur-vented/bellied Whistler, Sulawesi Spangled Drongo, Sulawesi (Rusty-bellied) Fantail, Pale-blue Monarch, Sulawesi (Slender-billed) Crow, Malia, Sulawesi Leaf Warbler, Sulawesi Grasshopper (Chestnut-backed Bush) Warbler, Sulawesi Babbler, Black-crowned White-eye, Short-crested (Sulawesi) Myna, Flame-browed Myna (Fiery-browed Starling), Grosbeak Starling, Yellow-sided Flowerpecker, Grey-sided Flowerpecker. Moluccan (Halmahera) Goshawk, Sultan's (Slender-billed) Cuckoo-Dove, Blue-capped Fruit Dove, Grey-headed Fruit Dove, Cinnamon-bellied Imperial Pigeon, Goliath Coucal, Blue-and-white Kingfisher, Sombre Kingfisher, Umbrella (White) Cockatoo, Moluccan Hanging Parrot, Violet-necked Lory, Ivory-breasted Pitta, Halmahera (White-streaked) Friarbird, Halmahera Cicadabird (Cuckooshrike), Rufous-bellied Triller, Halmahera (Dusky-brown) Oriole, Halmahera Spangled Drongo, Long-billed Crow, Halmahera Paradise-crow, Halmahera Golden Bulbul, Halmahera (Cream-throated) White-eye. 27/7 Arrival of group. 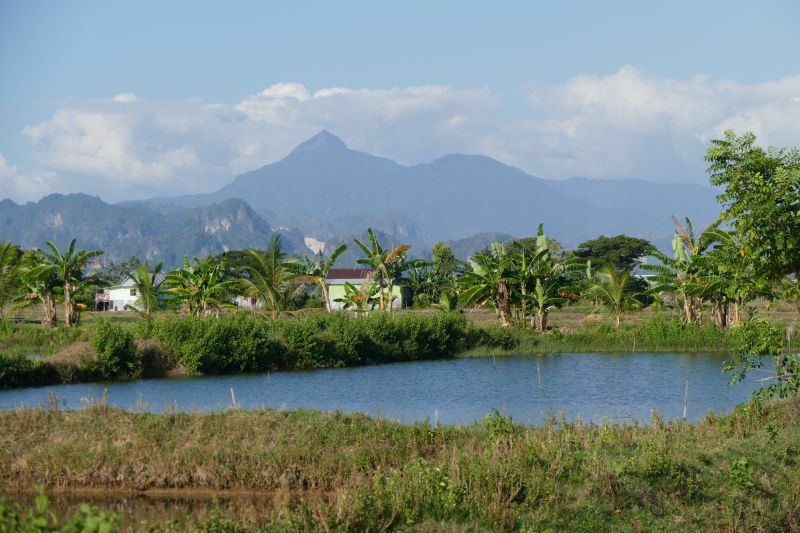 Fish ponds near Makassar. 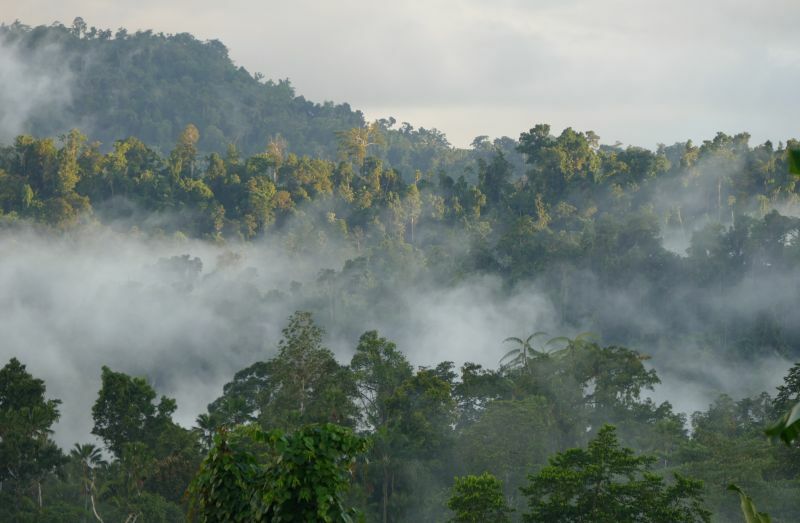 28/7 Morning Karaenta Forest near Makassar. 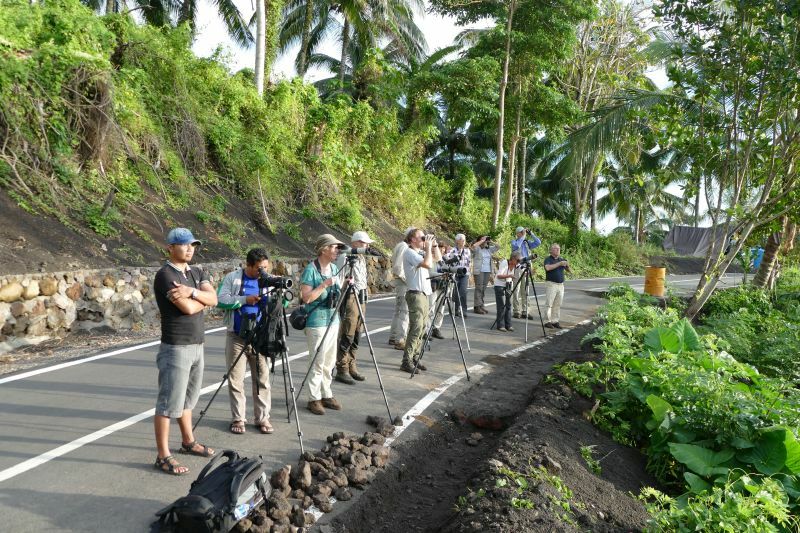 Afternoon birding near Palu after flight. Black-ringed White-eye, Sulawesi Streaked Flycatcher. 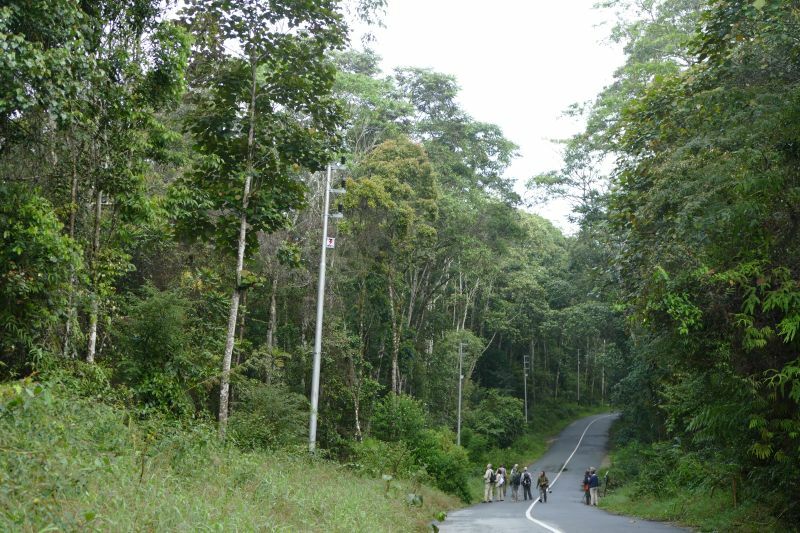 29/7 Drive Palu to Lore Lindu NP. Afternoon Lore Lindu NP. Sulawesi Honey Buzzard. LL: Satanic Nightjar, Black Eagle, Meyer's Lorikeet (from Citrine L). 30/7 Lore Lindu NP. Afternoon more open areas. Mountain Cicadabird (Sulawesi Pygmy Cuckooshrike), Lesser (Dark-eared) Myza, Blue-backed Parrot, Lesser Fish-Eagle, Ivory-backed Woodswallow, Gould's Bronze Cuckoo, Sulawesi Hawk-Eagle, Sulawesi Heleia (Streak-headed Darkeye). Cinnabar Boobook, Hoevell's Warbling-Flycatcher (Blue-fronted Blue Flycatcher), Sulawesi Thrush, Red-eared Fruit-Dove, Sulawesi Jungle (Blue) Flycatcher, Caerulean Cuckooshrike, Crimson-crowned Flowerpecker, Maroon-backed Whistler, Sulawesi Myzomela, Speckled Boobook. 1/8 Morning Lore Lindu. Afternoon near Palu. LL: Piping Crow (found by Nollie), Hylocitrea (found by guide Hersen), Great Shortwing heard closeby. 2/8 Travel day to Manado (2 flights). Late afternoon birding hotel garden Manado. Buff-banded Rail, Nankeen Night-Heron, Java Sparrow. 3/8 Drive to Tangkoko. 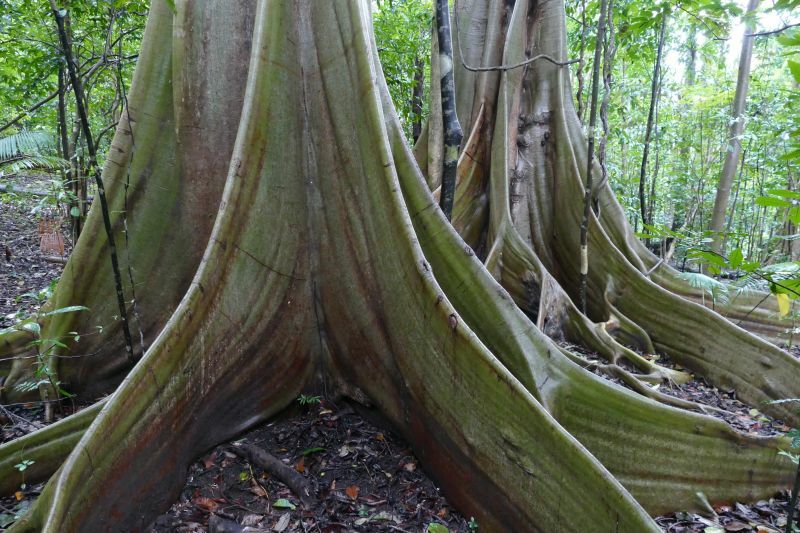 Afternoon mangroves (rain). Ornate Lorikeet, Tabon Scrubfowl (Phillipine Megapode), Lilac Kingfisher, Sulawesi Dwarf Kingfisher, Ochre-bellied Boobook, Sulawesi Nightjar. 5/8 Tangkoko. Afternoon mangroves again. White-necked Myna, Red-backed Thrush, Great-billed Heron, Ruddy Kingfisher, Channel-billed Cuckoo. 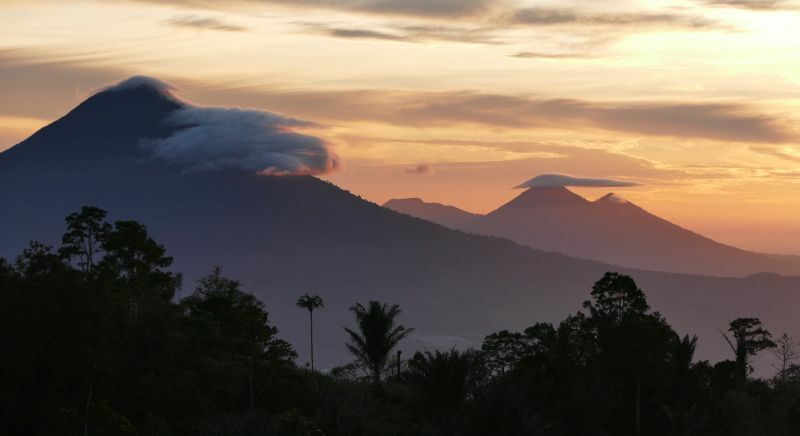 6/8 Drive to Tomohon area incl Gunung Mahawu. 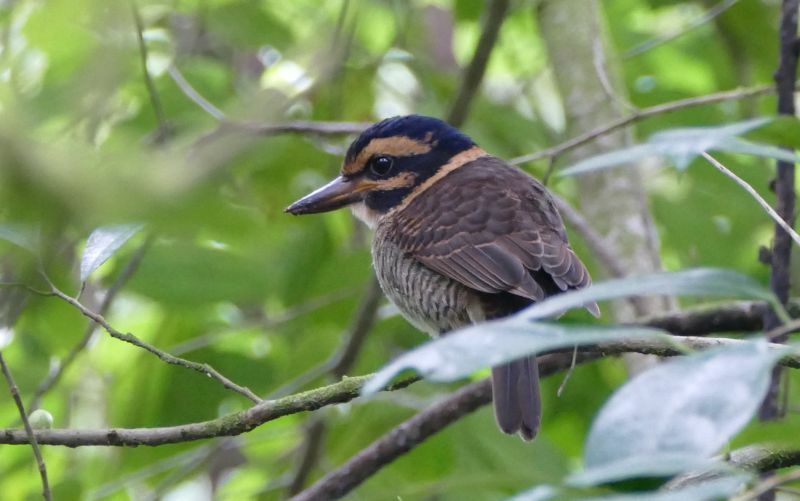 Pied Cuckooshrike, Isabelline Bush-hen, Dusky Moorhen, Scaly-breasted Kingfisher. Grey-headed Fish-Eagle, Oriental Hobby. Wandering Whsitling-Duck, Sunda Teal. 9/8 Gunung Ambang and Gunung Mahawu. Matinan Warbling-Flycatcher (Blue Fl), Sulawesi Serpent-Eagle. Purple-bearded Bee-eater only heard. 10/8 Travel to Halmahera. Drive to Weda resort. Beach Kingfisher, Metallic Pigeon, Moluccan Starling, Snowy-browed Flycatcher. 11/8 Forest near Weda resort and further away. Wallace's Standardwing, Nicobar Pigeon, Moustached Treeswift, Ivory-breasted Pitta, Drab Whistler, Wallacean Cicadabird (Common C), Moluccan Cuckooshrike, Moluccan Whistler, Wallacean Monarch, Molluccan Owlet-Nightjar. Chattering Lory, Halmahera Flowerpecker, Dusky Myzomela, Gilolo (Rufous) Fantail, North Moluccan Leaf-Warbler (Island LW), Great Cuckoo-Dove, Moluccan King Parrot, Moluccan Scops Owl. Moluccan Monarch (Slaty Flyc. 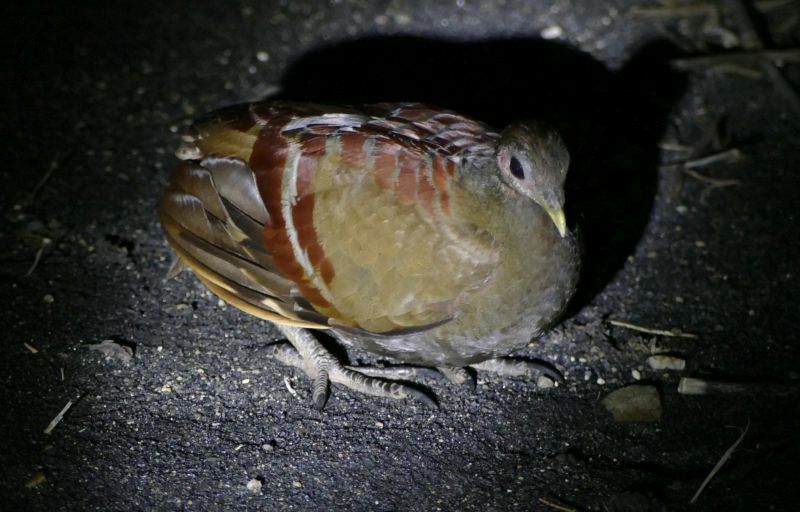 ), Dusky Scrubfowl, Shining Monarch (Flyc. ), Scarlet-breasted Fruit-Dove, Pacific Baza, Gurney's Eagle. 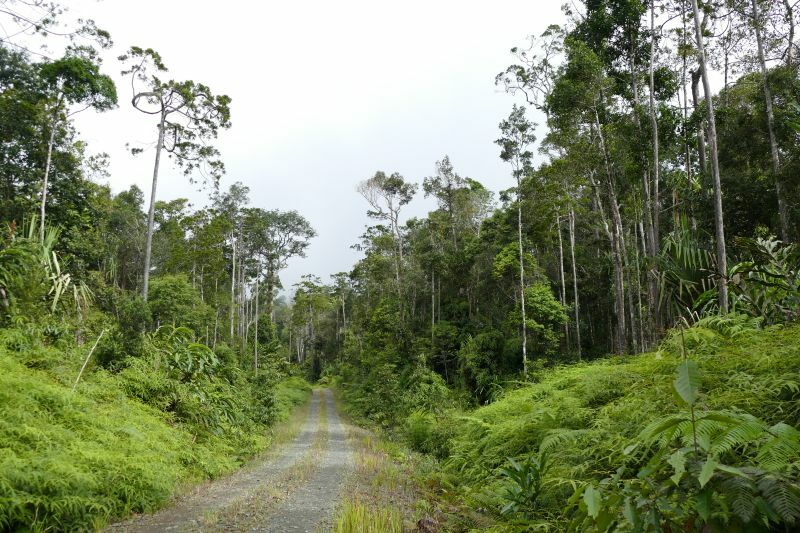 14/8 Drive to north Halmahera. Late afternoon and evening birding at megapode site. Azure Kingfisher, Greater Sand Plover, Moluccan Scrubfowl. 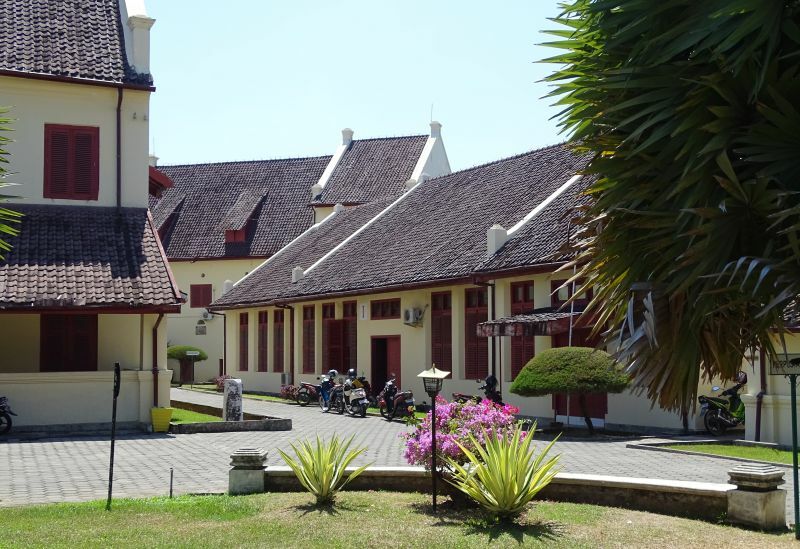 Nollie and I arrived a day earlier in Makassar so we took the opportunity to visit Fort Rotterdam from VOC times. 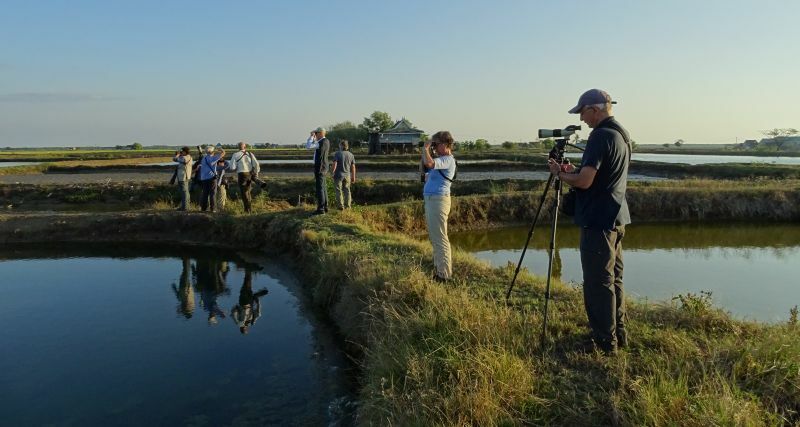 After arrival of the group we visited fish ponds near Makassar, good for waders and terns and other birds of open areas. 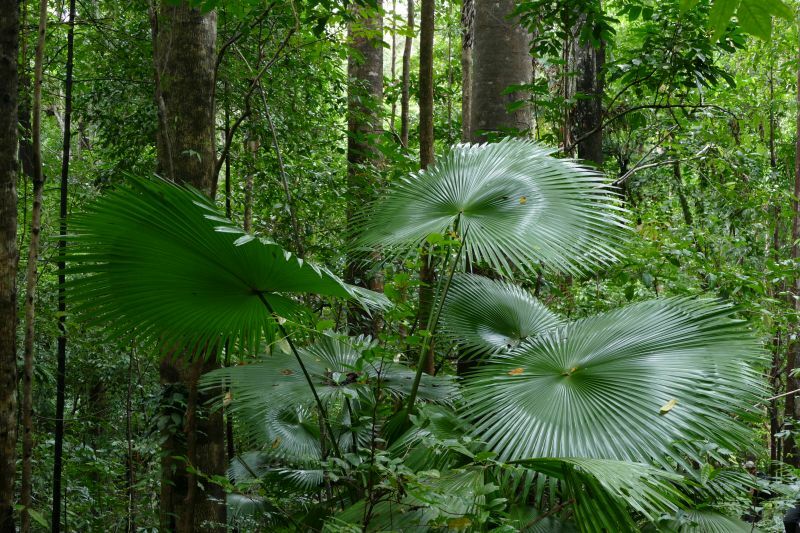 In the Karaenta Forest near Makassar. Anticlockwise: Angélique, Mieke, Nollie, Wim, Monal, Frans, Elly, Pieter, Laurens. 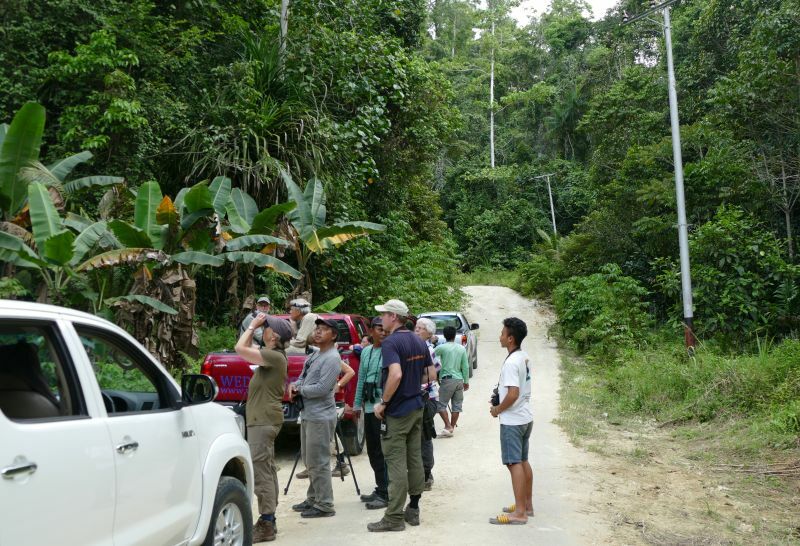 In this forest we were especially keen to see Black-ringed White-eye (only occurs on South Sulawesi) and the recently discovered Sulawesi Streaked Flycatcher. We saw both. Now in Lore Lindu national park Good birding from the quiet road. The always good-humoured Monal (right) giving instructions during a coffee break. Sitting from left to right: Wimmel, Angelique, Agnes, Mieke, Nollie. 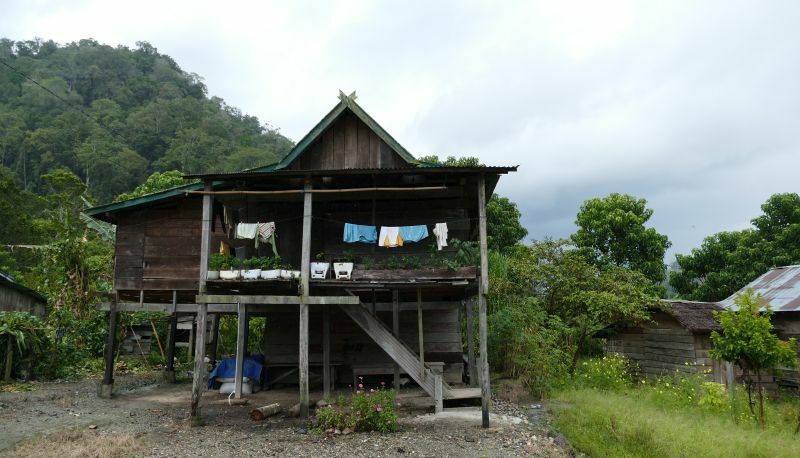 Typical countryside house in the Lore Lindu area. 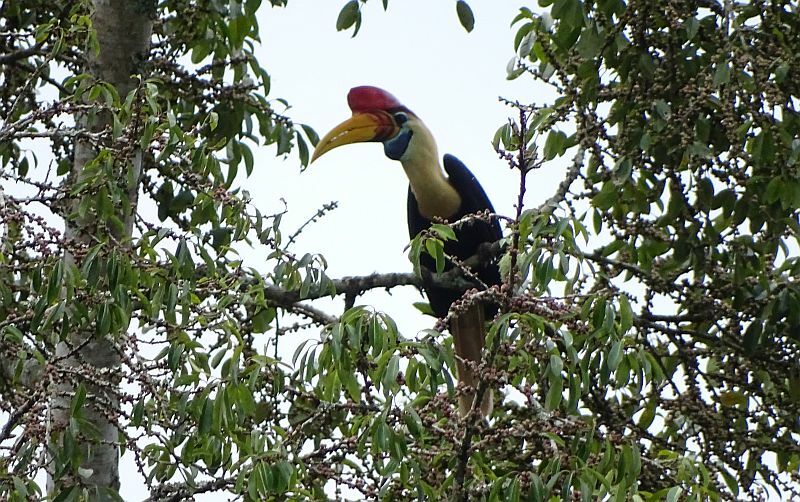 A fruiting tree in Lore Lindu NP with Knobbed Hornbill, a Sulawesi endemic. 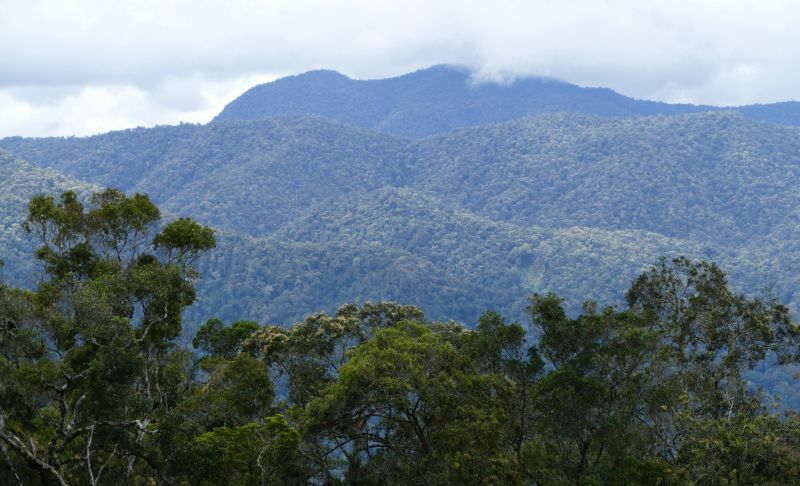 Lore Lindu is a massive forest area. We also birded some open fields nearby. Photo Agnes Coenen. 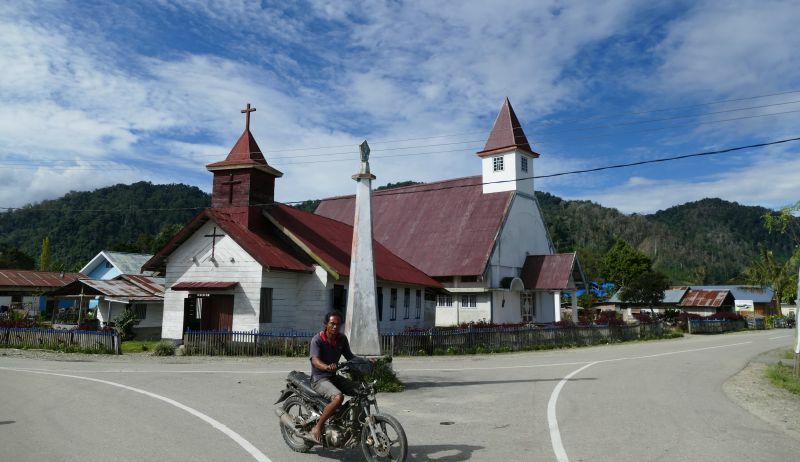 Churches are a common sight on Sulawesi. The Mama Sendy guesthouse of our stay in the Lore Lindu area. Our hotel at the border of Manado in the northeast tip of Sulawesi. Nice birds in the gardens. 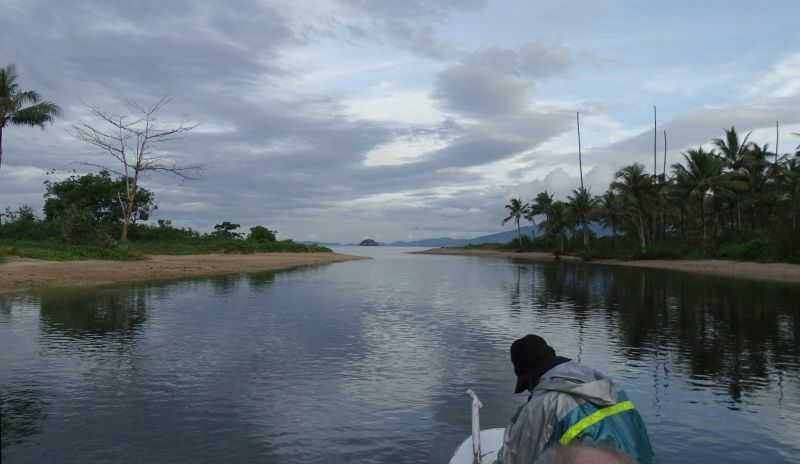 Our first views of the Tangkoko area. Gunung (mountain) Tangkoko in the background. 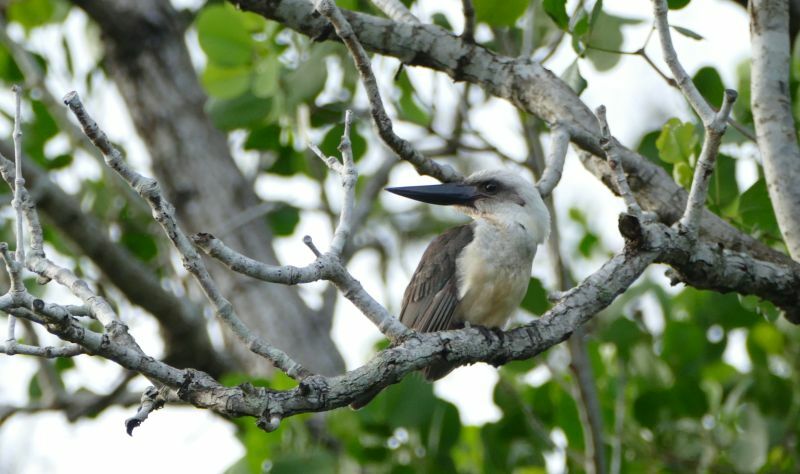 Tangkoko is famous for its kingfishers, both the forest species and the ones in the mangroves. We are heading here for the latter. From left to right: John, Nollie, Pieter, Laurens and the boatsman. Photo Agnes Coenen. 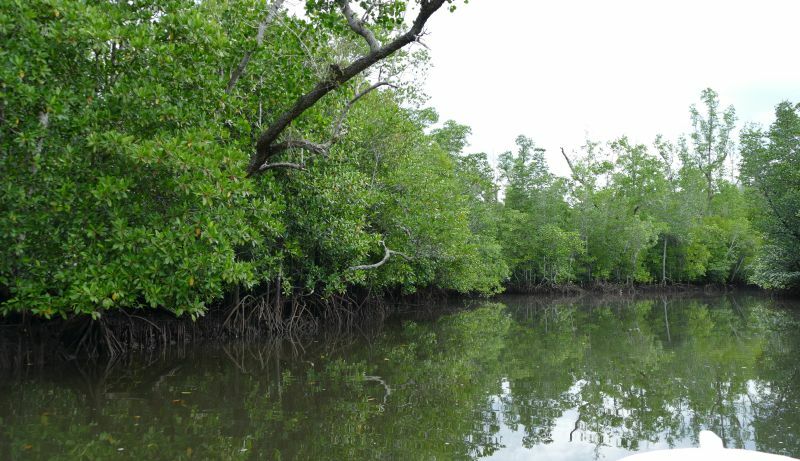 The largest of the many kingfisher species of Tangkoko is in this mangrove. Great-billed Kingfisher, a Sulawesi endemic. 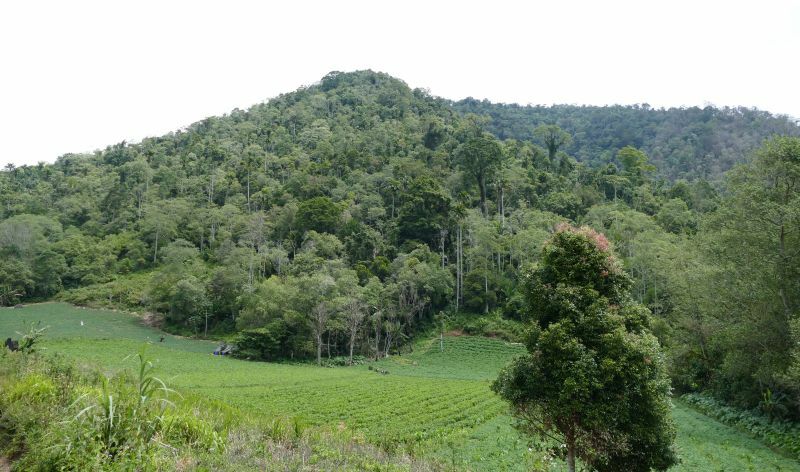 Forest on the slopes of Gunung Tangkoko. 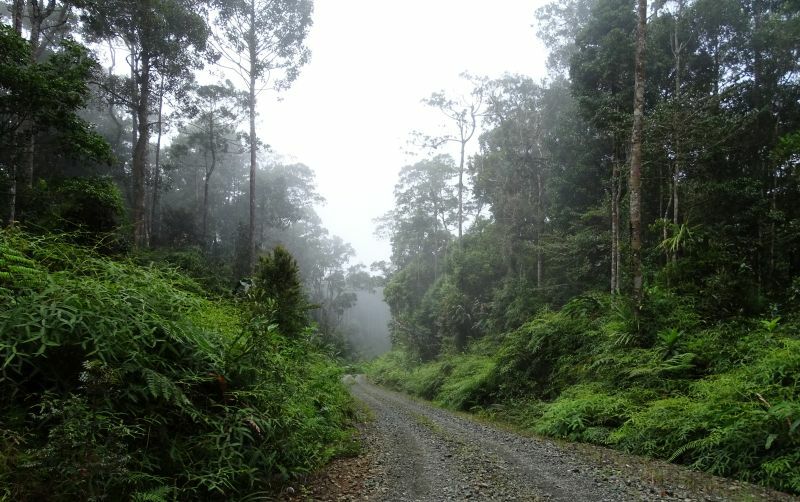 Foothill forest of Gunung Tangkoko. Scoped from the small road (photo below; Monal front right after Wim). Lookouts like this are good for spotting pigeons. A second visit to the mangroves. First boat: guide Anis (left), Wim, Mieke. 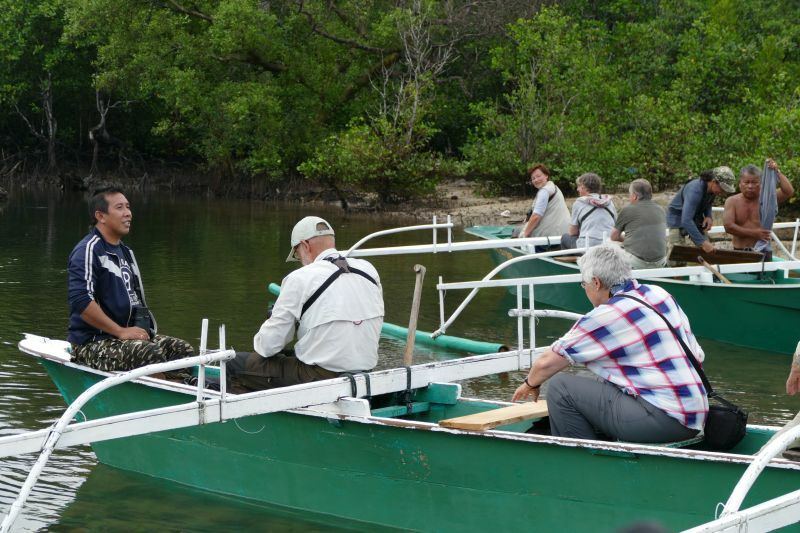 Second boat: Agnes, Angelique, Wimmel, Monal and their boatsman. 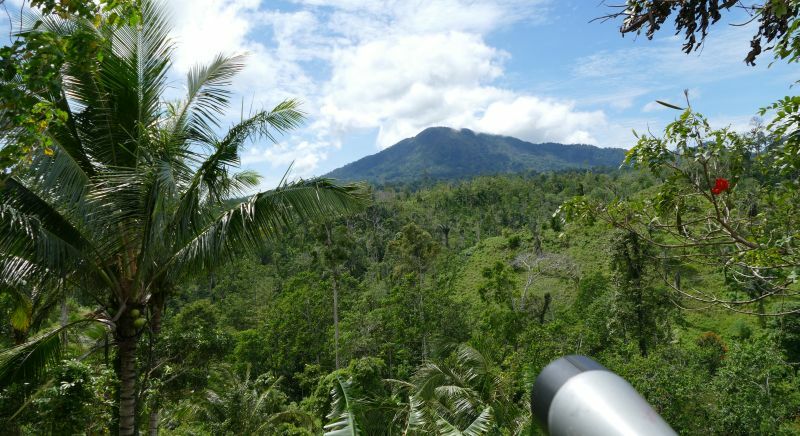 More scoping over the Tangkoko foothill forest. Our local bus driver (left) will warn us for traffic but gladly there is hardly traffic on this road. 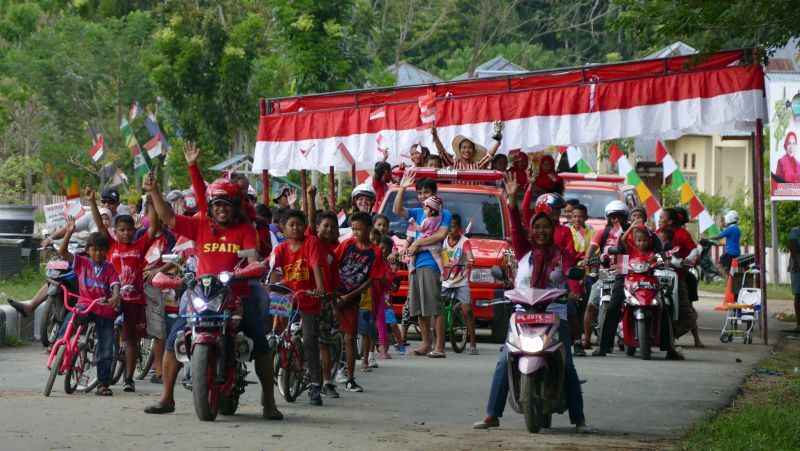 Typical street-side view in northern Sulawesi. Drying seeds, probably mostly cloves (kruidnagel). It was cloves which made the Dutch in VOC times coming here. 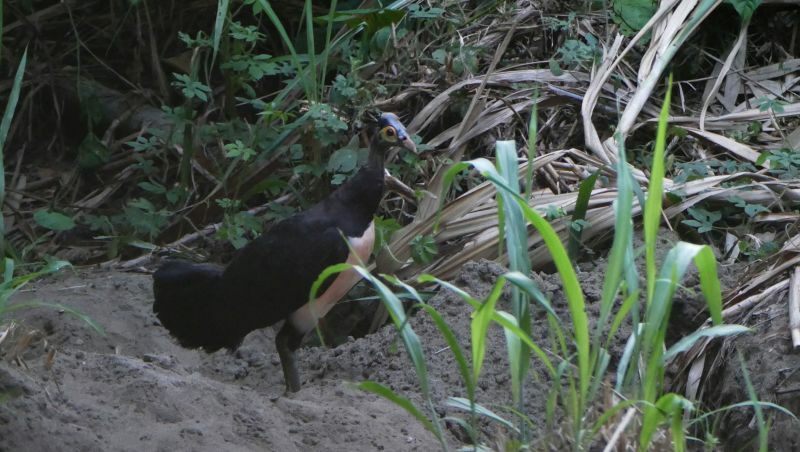 Maleo, a megapode endemic to Sulawesi. They bury their eggs in the sand which is heated by geothermal activity. We were priviliged to see them so close from a hide. Okay, after a long wait (they are very shy), but absolutely worthwhile. Agnes and Laurens' turn to be brought to the other river bank, for our visit to the Bogani Nani Wartabone national park. Along the road back to Kotamobagu town. 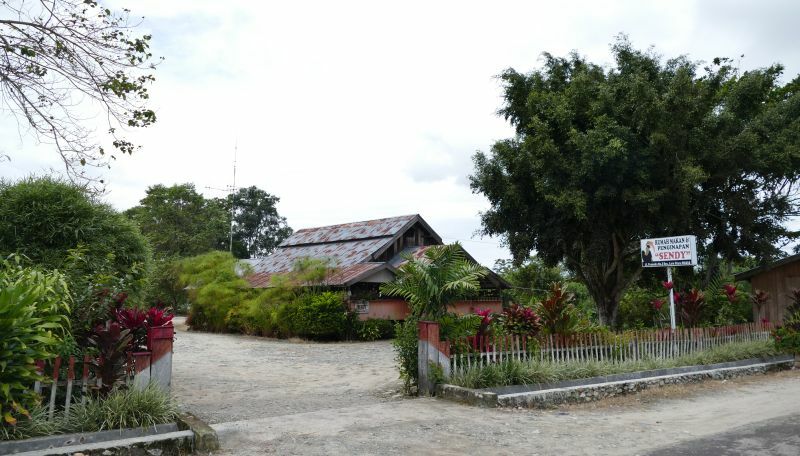 Gunung Ambang area east of Kotamobagu. 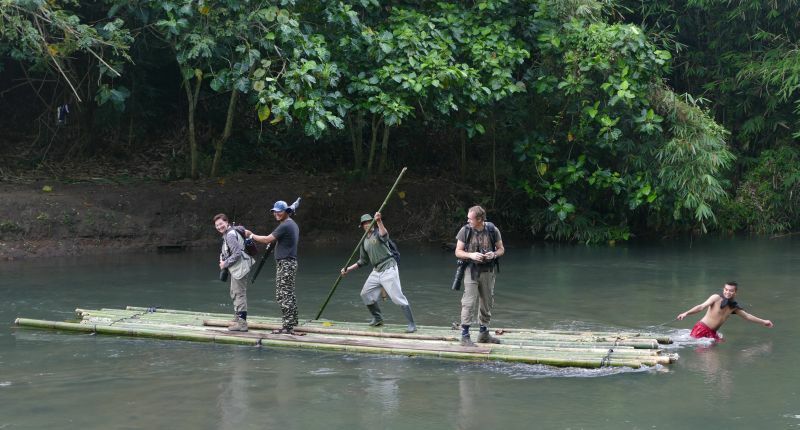 Near Tomohon, where we had our succesful search for Scaly-breasted Kingfisher at Gunung Mahawu. Our last day on Sulawesi. We flew from Manado to Ternate, the volcanic island in front of Halmahera. Scaly-breasted Kingfisher, one of the highlights of the trip. Not garantueed, and it would be a pity to miss this beautiful but elusive forest kingfisher after seeing so many other kingfisher species. 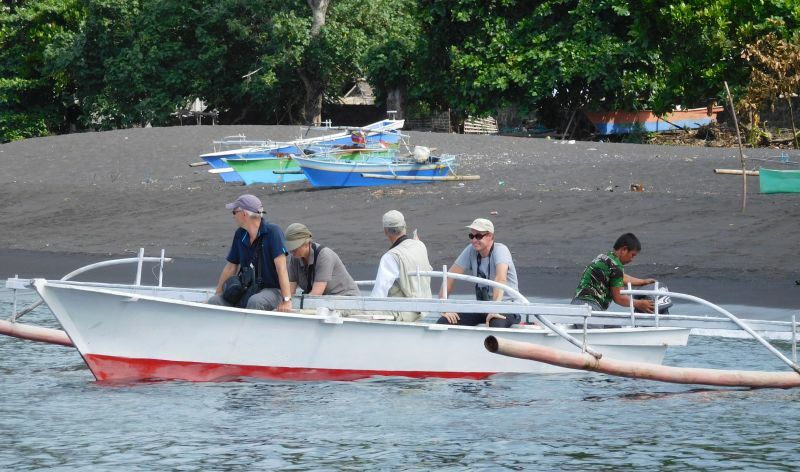 Departure by speedboat from Ternate to Sofifi on Halmahera. 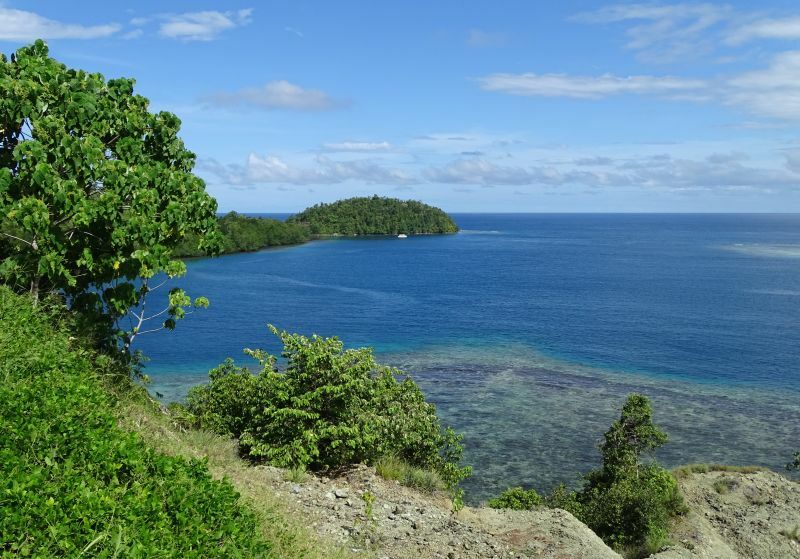 Now on Halmahera, near the Weda resort. The porch of our private bungalow at Weda resort. Not bad! Soon we found the star bird of the trip, the Wallace's Standardwing Bird-of-Paradise. More pics are in the bird photo page. 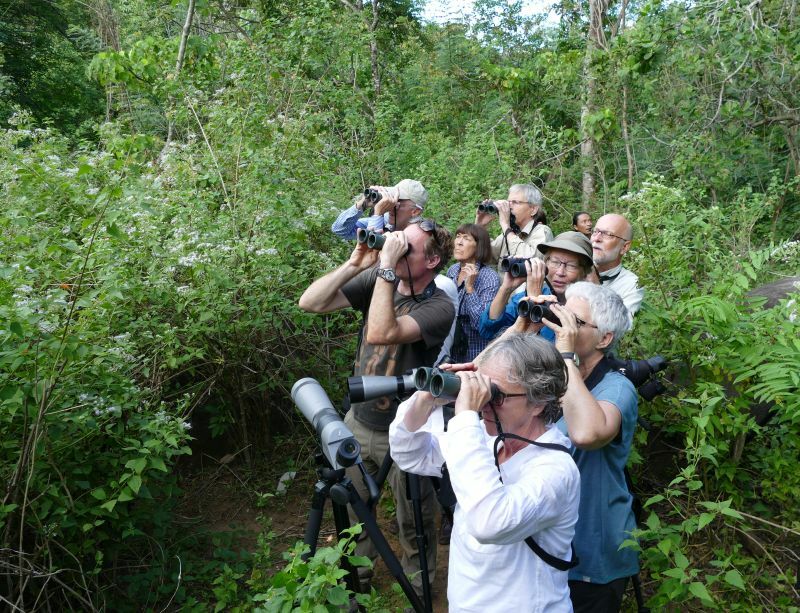 Birding the forests near the Weda resort. 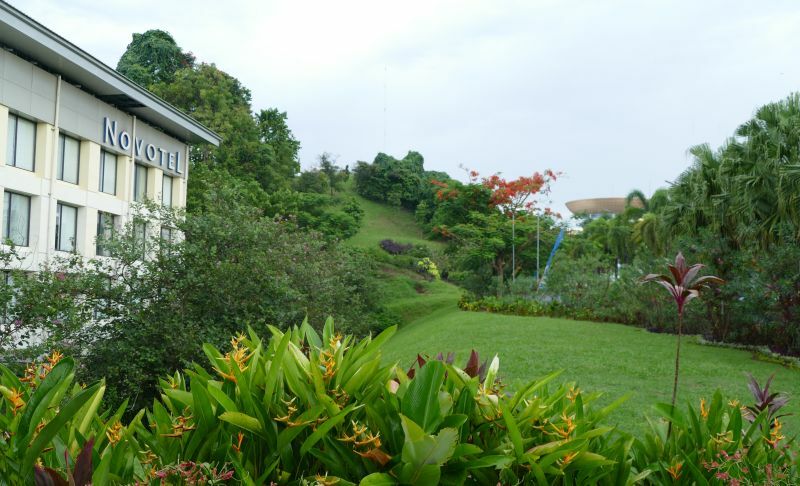 View from the Weda resort. At the start of a small trail into the dense forest. But also birding along these sand roads near Weda resort was very rewarding. 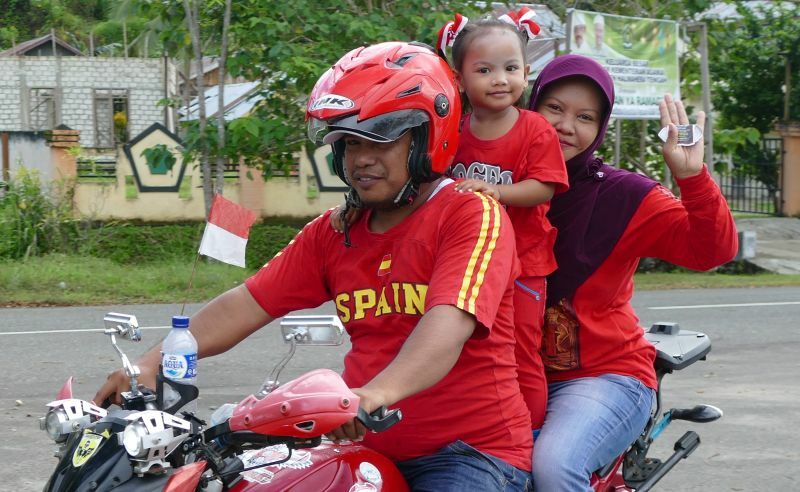 On our way back from Weda to Sofifi and beyond we witnessed a local celebration of the National Day (three days in advance, on Sunday). View on Ternate vulcano from Halmahera while driving north to the Moluccan megapode site. 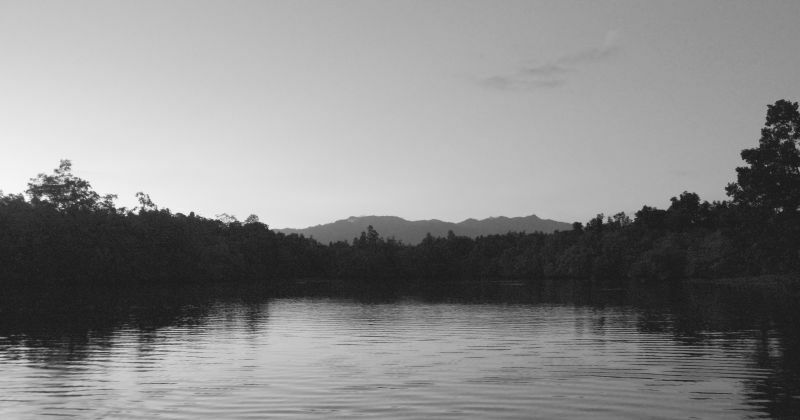 Crossing, in the evening, the lagoon to the broad sandbar where the megapodes lay their eggs. Moluccan Scrubfowl, another megapode of this trip. Look at the enormous feet needed to make holes in the sand for laying their eggs. In contrast to the Maleo it is probably not geothermal activity which hatches the eggs, but the heating of the black vulcanic beach sand by the sun. This list is taken from the list of the whole group, updated in the evenings. I have adjusted the taxonomy and bird names as much as possible to the new field guide Birds of the Indonesian Archipelago, which appeared after our trip. Often the old name is before the '/' and the new name behind it. Note the many recent splits. #days = the number of days the species was observed, by the group. H = present on Halmahera but not on Sulawesi. See also the page with bird photos.